SopCast is a free and simple way to watch online TV. You can broadcast videos and audios with this application on the internet. Since I discovered SopCast, I have been enjoying quite a lot of online TV programs ranging from movies to documentaries and sports. SopCast is a free P2P streaming TV player which lets you watch online TV programs on your computer. To get started with sopcast, first download a copy of this application from their website. 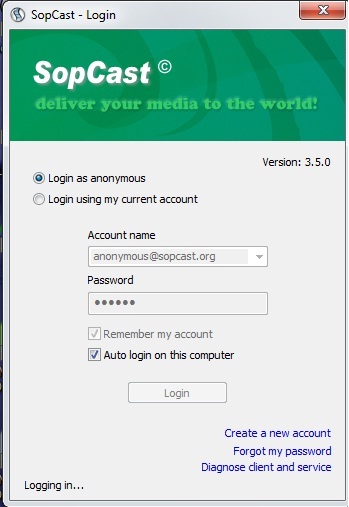 SopCast is compatible with Windows, Android, and Linux. Download and install the appropriate version for your device or operating system. On completion of the installation, launch the SopCast application installed on your system. You can login as anonymous by simply clicking on the Login button. On successful login, You can either enter an online TV channel address on the “Address” bar and click on the forward arrow next to it if you have an address or simply click on the “live channels” tab to choose from the listed channels. (The address looks like this sop://broker.sopcast.com:3912/100287) Visit livefootballol http://www.livefootballol.com/sopcast-channel-list.html for Sopcast football channel links. Now you can choose from the categories listed on the Live channels, Sports, news and Education, Entertainment channels, comic, Tv series, Enduro and MX, CCTV group channels etc and many more. Click on any channel of your choice and see a media player that looks like Windows media player slide from the right and after a little moment it connects and start playing live online TV program. Now you can watch your favorite online TV channels using this great software application. If you have any comment to add, please use the comment box below to share with us your personal experience with SopCast. Please share this post with your friends, If you like this blog posts Subscribe to NetMediaBlog Feeds by Email so you can be getting more of my posts on your email even when you are offline. Wow this is a very great tutorial, would bookmark and download later, my internet connection is in a mess right now, if i have any issues or it didn’t work, i’ll come back, thanks you are doing a great job, keep it up. This is one cool software I have set my eyes on. Let me bookmark this and come back for it later after my conference. Who needs TV when you can do it from your laptop now, eh?